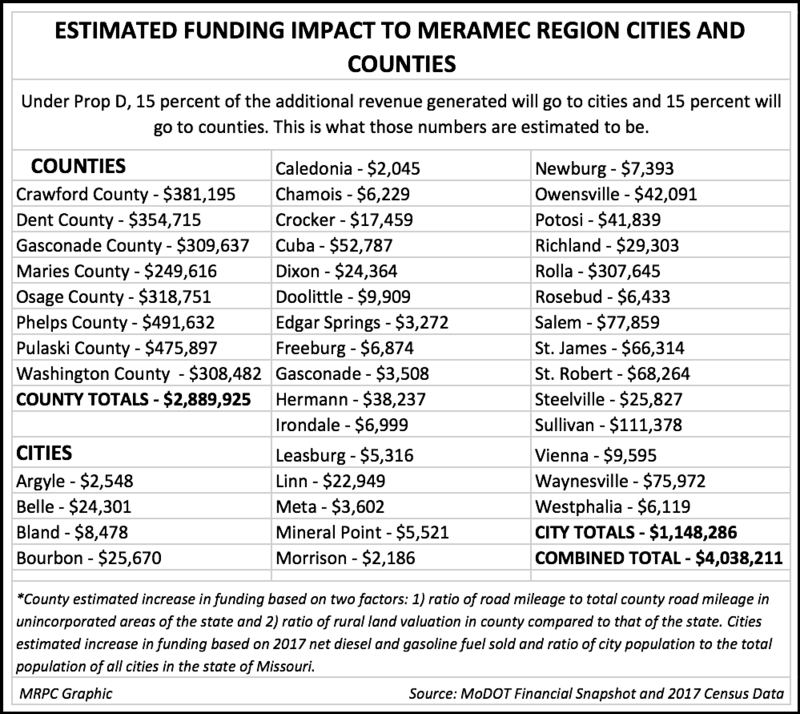 ST. JAMES—When fully phased in, Proposition D – the statutory referendum to increase the state fuel tax by 2.5-cents annually for four years – would generate an additional $4 million for Meramec counties and cities to use for streets, roads and bridges. This estimate is based on 2017 fuel usage. Statewide, Prop D would generate an estimated $412 million in new revenue when fully phased in 2022. Of that, 70 percent is allocated to the Missouri Department of Transportation (MoDOT) interstates, highways, bridges and state law enforcement while 15 percent is allocated to counties and 15 percent is allocated to cities. Currently the state’s fuel tax is 17-cents, collected at the pump on gas and diesel, and has not been increased since 1996. If you adjust for today’s inflation rates, the 17-cent fuel tax is worth about 7-cents in 1996. Essentially, the 10-cent fuel tax increase compensates for inflation over the past 20-plus years. If passed, the measure is estimated to generate at least $288 million annually to the State Road Fund to cover the amount of road fund dollars used each year for Missouri State Highway Patrol activities and $123 million annually to local governments for street, road and bridge construction and maintenance. Missouri is currently ranked 49th in the nation on fuel tax and ranks 46th in the nation on revenue spent for transportation funding. With the 10-cent increase at the end of the four years, Missouri would be at 27-cents and comparable to surrounding states that fall into the 20-30 cent range, excluding Oklahoma, which is lower but has toll roads to supplement transportation funding instead. But how much is it going to cost the taxpayer? For every 2.5 cent increase in the motor fuel tax, the average driver will spend an additional $1.28 per month – less than a cup of coffee at Starbucks. At the end of the four years, if Prop D passes, the average driver would spend an estimated $5.12 more per month on fuel – less than most fast food meals. The issue will be on the Nov. 6 Missouri ballot. A diverse group of farmers, businesses, labor, law enforcement and local government leaders has formed SaferMo, a coalition campaigning in favor of Prop D. Their website is SaferMo.com. There is no organized opposition at this time. Formed in 1969, MRPC is a voluntary council of governments serving Crawford, Dent, Gasconade, Maries, Osage, Phelps, Pulaski and Washington counties and their respective cities. Washington County Presiding Commissioner Marvin Wright serves as chair. A professional staff of 25 offers technical assistance and services, such as grant preparation and administration, housing assistance, transportation planning, environmental planning, ordinance codification, business loans and other services to member communities.